If you're like me, you like to keep your lips smooth and soft - and ready for kissing at any moment! As a good Aussie-gal I have a healthy stock of paw paw ointment stashed around the house (and in every handbag), but I'm always open to new products. Enter eos (evolution of smooth). My gorgeous mother sent me this delicious lip balm as a gift. And because of its fantastic packaging, it sits nice and pretty on my desk while I'm working everyday. Thanks Mom! 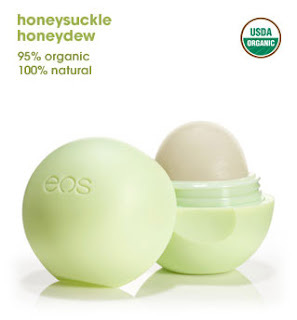 eos is USDA certified 95% organic, 100% natural, with key ingredients shea butter, vitamin E and jojoba oil. It's very hydrating and long-lasting, and the perfect accessory for any sustainable fashionista. eos also make body lotion, hand lotion and shave cream. Widely available in the US through Walmart, CVS, Costco, Rite Aid, Target and others. Australians can purchase online for a flat shipping rate of $15, a great opportunity to buy some for yourself and your girlfriends.